It’s natural for parents to want to care for and protect their baby. 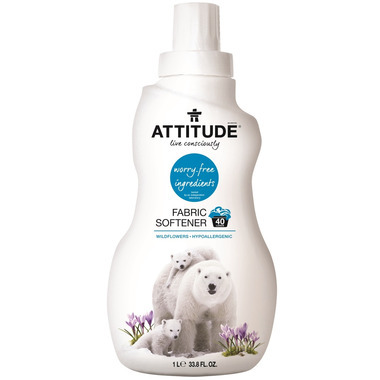 ATTITUDE Fabric Softener Wildflowers offers a safe alternative that is free of cancer-causing contaminants. Making clothes static-free and huggably soft, ATTITUDE Fabric Softener Wildflowers is the best choice for moms and dads. Smells lovely, not too strong. Works well, easy to pour. Love the product and the fact it contains no toxic ingredients! There was no mention of this softener containing fragrance in the description of the product. The ingredient list on the bottle itself does mention fragrance. Although it does smell nice in the end, it wouldn't be suitable for people with fragrance allergies. I also find that it doesn't work very well for static cling. However, the shape of the bottle makes it easy to hold and pour. I love this for my babies clothes! It's my favourite fabric softener! This is my favourite fabric softener. I am allergic to most things and this is wonderful. No reactions, paraben free and the scent is lovely. This fabric softener is the only thing that won't give my baby a rash! The scent is nice and light , and I love that it's all natural. I can't find this product in store anymore so I'm really glad it's available on well.ca! Love the mild sent and leaves clothes smelling fresh and soft and not chemical. I love the fragrance and I have very sensitive skin, so I need soft clothes. I use this for my delicates that don't go in the dryer. One thing, I accidentally got some on my arm. I rinsed immediately, but a rash appeared where it had contact and was itchy and irritated for hours., despite numerous gentle washing sand lotion. I like this one. It smells awesome and softens better than my usual eco friendly softener. Another item I will be buying again. My laundry feels so silky soft after only a half cap in the rinse. The scent is pleasant as well.